Discussion surrounding global current events took center stage at a panel April 6, as academics and professors from Boston area universities congregated with other speakers from the International Monetary Fund and the INDDEX Project to explore the dynamic field of international relations and global politics. 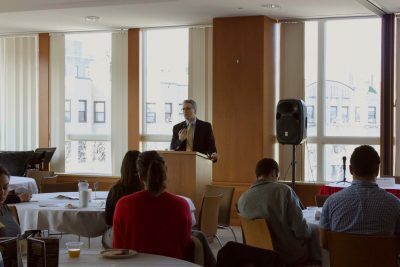 The Delta Phi Epsilon Gamma Chapter, an international business and foreign service co-ed fraternity that was reactivated at Boston University in 2016, hosted the panel in collaboration with the Philosophy, Politics and Economics Society and [email protected] The panel, titled “Intersection: Merging Platforms on the International Stage,” took place at the Hillel House. Maria Vallejo, a senior studying economics and international relations at BU, is the executive president of the Delta Phi Epsilon Gamma Chapter and helped organize the Intersection event. This international relations conference emphasized creating open conversations about current events and global politics. By having a diverse group lead the discussions, attendees were exposed to a greater network of people and ideas, Vallejo said. Tengi Shiga, a junior at BU studying political science, serves as the vice president of professional relations for the fraternity’s chapter and said the event was originally held every year in Washington, D.C., by the Alpha chapter of Delta Phi Epsilon at Georgetown University. This is the first semester that is being held here in Boston, she said. “We realized it was a really great opportunity to expand our role in the organization,” Shiga said. Olivia Lewis, a freshman in the College of General Studies, said she attended because she was interested in seeing the work her fraternity had put into it. Panelist Sarah Wafa, assistant researcher on the International Dietary Data Expansion Project at Tufts University, spoke about her experience with applying her understanding of other cultures to research and work. “Diversity is important because it ensures that the platform is going to serve the global community and make sure that it is adaptable for global use,” Wafa said. Wafa explained her role working on the INDDEX Project, which aims to tackle the scarcity of dietary data to aid food, nutrition and agricultural policy and programming, and said she saw in her field all that comes with the politics of malnutrition. Vallejo explained the panels centered around bringing many different platforms to one stage to take on the range of topics within international relations. This idea of coming together to share ideas was consistent throughout the event. Wafa’s experience shared similarities with some of the other panelists. Regina Bateson, an assistant professor of political science at MIT, spoke on the panel about the importance of having people from different backgrounds working to resolve conflicts in international politics, as well as a cultural understanding of the regions they’re working in. “[It is vital to] not just rely on one type of person or one type of source, but to the best extent possible that we can, get a variety of perspectives to get full information,” Bateson said during the panel. Bateson went on to talk about the importance of clear communication in international relations fields, especially when multiple organizations are involved. She said communication among different organizations and locals paves a way for positive change. After the conference, Vallejo said she hoped the audience left with better understanding of the complexities and similarities of the vast fields of international relations and global affairs.